Google announced that advertisers will no longer have the ability to add “Other interests” as a targeting method for advertising on the Google Display Network (GDN), effective January 15, 2015. This news comes in the wake of Google’s rollout of more sophisticated interest-based targeting options over the past couple of years: “Affinity” and “In-market” audiences, and the more recent introduction of “Custom Affinity audiences” in October of this year. Although there will no longer be an option to add “Other interests” after January 15th, existing AdWords campaigns already targeting those categories will continue to do so until June 2015, at which point the targeting will be automatically upgraded to the new audiences. With the upgrade right around the corner, it is important to have a thorough understanding of interest categories and a PPC management strategy to take advantage of them. Being the broadest of the interests methods, Affinity audiences are primarily used to raise brand awareness while reaching new potential customers. According to Google, Affinity audiences “show your ads to unique audiences based on their lifestyles, buying habits, and long-term interests”. Since it has the ability to reach consumers in large numbers, frequency capping and CPM bidding is recommended, but not required. Pairing Affinity audiences with other display targeting options such as keywords or placements could be an effective way to not only raise brand awareness, but also generate conversions. Don’t see any Affinity categories that are applicable to your product or service? – Use Custom Affinity audiences to find niche segments and create audiences tailored for your brand. Instead of selecting interests from a list, you define them yourself by entering specific interests (as if they were keywords) and/or adding URLs that that contain content related to the interests of your potential customers. This allows AdWords advertisers to raise brand awareness and drive consideration for a product/service to a large, but clearly defined, segment of users. The recommended bidding strategy for Custom Affinity audiences can vary depending on the amount of information you provide; CPC bidding may be best for detailed lists with many custom interests and/or related URLs added, and CPM for less specific audiences. When targeting In-market audiences, Google will find and show your ads to users that are actively searching out the products or services you provide; reaching consumers across the GDN when they are ready to make a purchase. At this time, there is a limited amount of categories to choose from, but I predict a customizable list of some sort in the future. Google recommends not adding any other targeting method while using In-market audiences, as it will limit the volume of impressions and cause you to miss out on possible conversions. Since generating conversions is what In-market audiences is designed to do, CPC bidding should be used along with conversion tracking in order to measure the effectiveness of the targeting. 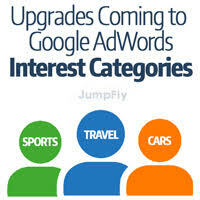 Even though the “Other interests” categories will be available until June 2015 (if already in use), making proactive changes to the interests categories before the forced upgrade would be optimal to ensure the transition goes smoothly and that you are the targeting audiences that will get you the most out of your Google AdWords advertising budget.